After a long hiatus, the Mad Men season 5 premiere is just around the corner. With the premiere set to air this Sunday, what better way to get in the Draper spirit than to take a look at the man himself (in infographic form). 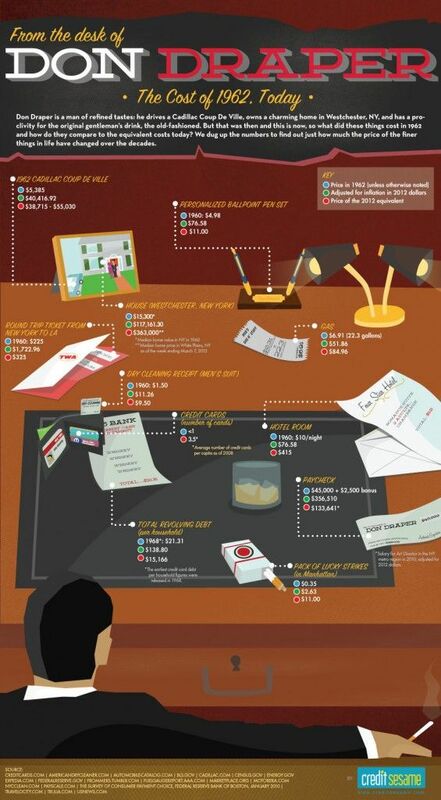 Breaking down the life of Don Draper, the infographic compares the cost of Draper's life in 1962 with what the equivalent would be in today's world. While living the life of Don Draper may have been difficult in 1962, it appears even more so in today's world – especially with a significant pay cut stemming from what his position would earn now. Funny how most of the numbers don't even remotely match up with "inflation," eh?